An extraordinary growing season and a terrific harvest. Fortune has smiled on us this year and we’re all the more grateful considering the difficulties facing many growers elsewhere in France. The tanks above shows the lottery of growing grapes. 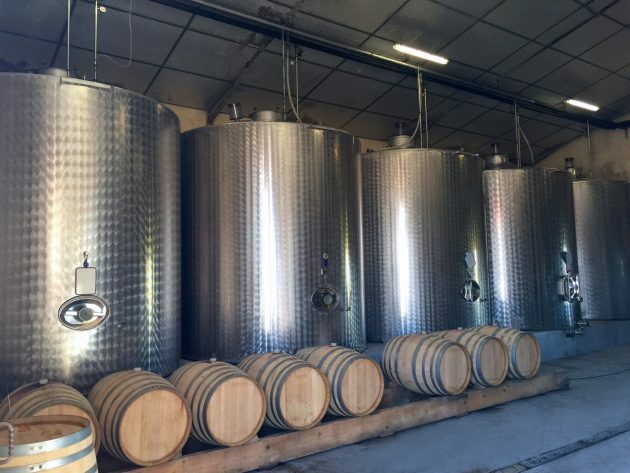 Normally, we make roughly the equivalent of three of our 20,000 litre blending tanks of white wine. In 2013, after a 10-minute August hailstorm, we made just one. This year, touch wood, we’ll fill almost five. As our biggest selling white – our straight Sauvignon Blanc – sold out within a few months, that’s welcome news. For Daniel, Nelly and me, this was our 18th harvest together. Daniel’s first at Bauduc was in 1986 and Nelly joined as a trainee when we arrived in 1999, and stayed. Our average yield over the last ten years has been a fraction under 40hl (4000 litres) per hectare for both white and red, and the last time we got close to 2016 yields was in 2005. Since then we’ve re-structured – as in, ripped up and replanted – about two thirds of the vineyard, and a good return is probably long overdue. It does, though, take a little while for young vines to find their feet. We’re allowed to make up to 65hl per hectare for white wine, and 58hl/ha for red or rosé. Barring disasters, we’ll achieve that for our 14 hectares of white and 8 hectares of red that are in production (with another hectare each of young Merlot, Cabernet Franc and Cabernet Sauvignon coming on stream next year). The official déclaration de récolte has to be completed by the end of November. 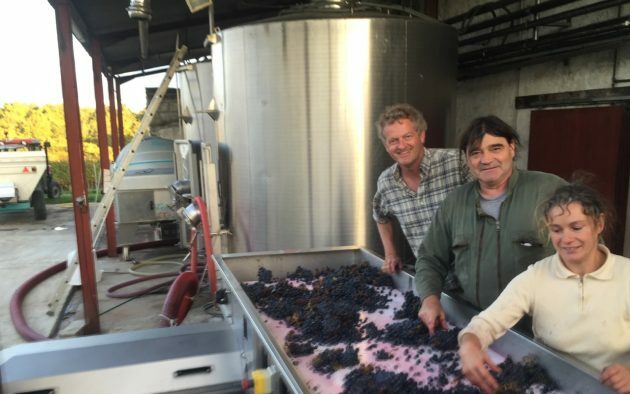 What’s even more important is the quality because, in some years, not every tank – or parcel of vines – makes it into the final blend. 2013, with its hail-damaged fruit, being an obvious example (we sold a chunk off in bulk). This year, as the long, cool fermentations on the whites come to a close, we’re confident that we’ll bottle everything. 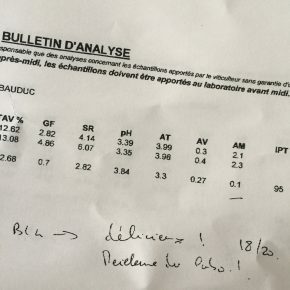 When our respected oenologue (enologist) from the local laboratory marks our Sauvignon Blanc ’délicieux ! 18/20 – Meilleure du labo !’ we have every right to be optimistic. In total, then, we should have around 120,000 bottles of white, including 20,000 of Les Trois Hectares and sparkling Cremant combined. 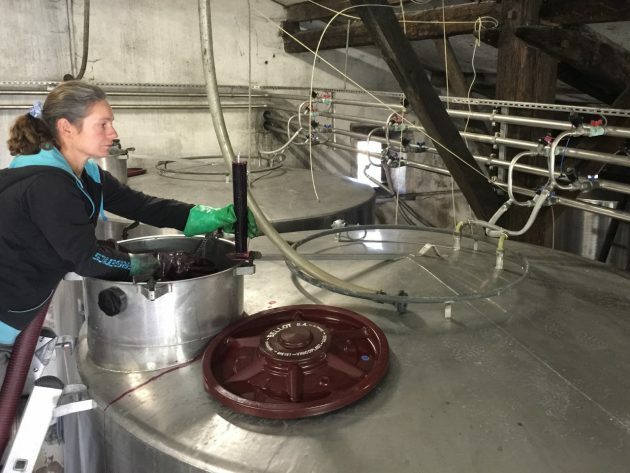 Given that it costs us about 80 centimes for each bottle for the Sauvignon in January, including all labour and packaging, that’s a different sort of challenge – albeit a good one. We’ll ponder that as we stir the lees. Literally. The rosé is equally good and, meanwhile, we’re pumping over the reds. They too look terrific. Rich in colour, aroma and flavour. More anon.